Ideal Easter devotional with 50 short chapters putting the crucifixion back into perspective. ‘Risen’ is a daily devotional book that puts the crucifixion back into perspective – an absolutely incredible event that’s changed EVERYTHING. 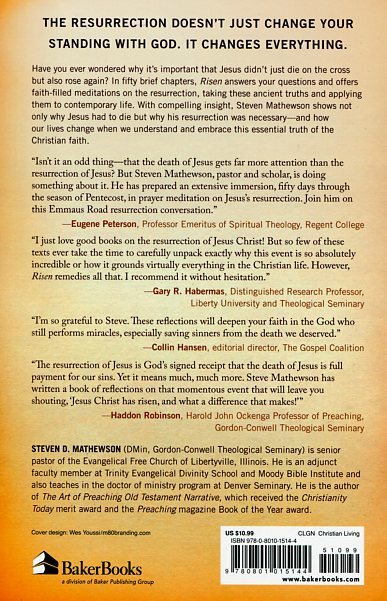 Steven Matthewson, respected pastor and scholar, carefully unpacks why the resurrection is worth more than a yearly celebration; it deserves our every thought as the amazing foundation of Christian life. Written in 50 brief chapters, each focusing on a single impact the resurrection has on you. With theological clout and engaging narrative, this insightful book speaks directly into contemporary life. An ideal post-Easter devotional (set against the backdrop of the Pentecost) or as an alternative devotional over Lent, ‘Risen’ will reconnect your daily life with the absolute power and far-reaching implications of the empty cross. Risen by Steven D. Mathewson was published by Baker in February 2013 and is our 28582nd best seller. The ISBN for Risen is 9780801015144. I devoured this book in just a few hours. However, the author's intention is that the fifty short chapters should be read at the rate of one reading a day. And he suggests that a good day to start would be on Easter Sunday. Anyone doing this will arrive at the last chapter on Pentecost Sunday. I plan to do this next Easter! Steven has a real gift for making a complex subject easy to understand. As I read some of the chapters I felt that light-bulbs were clicking on in my mind. His enthusiasm for the subject lights up every page. This is an important book, because for many people Jesus' Resurrection is just a footnote to His death on the Cross for our sins. But as you read these meditations you will clearly understand how the Resurrection changes everything and has a powerful impact on our lives now and throughout eternity. I can wholeheartedly recommend this book. Got a question? No problem! Just click here to ask us about Risen. The resurrection doesnt just change your standing with God. It changes everything. Have you ever wondered why its important that Jesus didnt just die on the cross but also rose again? 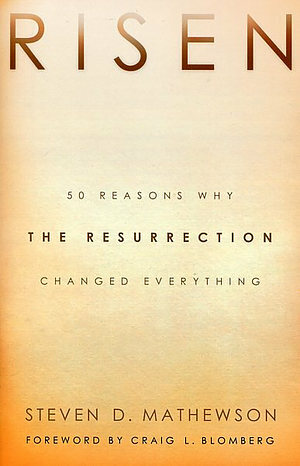 In fifty brief chapters, Risen answers your questions and offers faith-filled meditations on the resurrection, taking these ancient truths and applying them to contemporary life. With compelling insight, Steven Mathewson shows not only why Jesus had to die but why his resurrection was necessary-and how our lives change when we understand and embrace this essential truth of the Christian faith.